That moment when you open the closet door and think "what the hell will I wear today?" I was having one of those moments Monday, but I manage to come up with this chic kind of Parisian look. Black and white has to be one of my favorite combos. When in doubt wear black! I am obsessed with this blouse I can't wait to pair it with jeans, maybe a jean skirt and cut-offs denim shorts. I wore this outfit to the office and people couldn't believe I purchased this top for just $4 bucks. A wonderful investment! 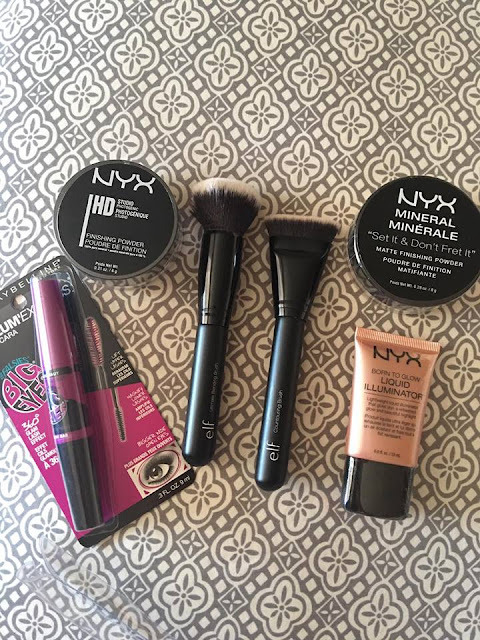 I have always been a fan of NYX but never tried the finishing powders until I picked them up on a recent trip to the store. I have been using them for about two weeks and I loved them. I heard about this magnetic mask and how good it leaves your skin, even though I received it a while ago I am so scared to try it LOL It retails for $75 but Walmart hast it for $70. I guess I should give a try right? Lastly, I have a collection of white pumps that I can't wait to start wearing. Hopefully the weather cooperates and Spring will finally get here. Denim on denim is a combo that I will never get tired of wearing, specially this one in particular with the beautiful embroidery on the jeans. The hat and boots make it a bit edgy with a classic twist. This was the perfect outfit for dinner and a movie on Sunday. I love mixing classic pieces with trendy newer styles. I am a child of the 90's and velvet was very big around those years and I can't express how much I love that is back! I wore this low cut bodysuit with skinny jeans and boyfriend blazer to a friend's birthday party on Saturday and my shoes as cute as they are, were killing me LOL! That moment when the weather warms up in February and all the floral starts emerging from the closet, that happened to me last week. What a teaser we had!! It is now cold again and the bubble coats are out. Anything off the shoulder I love right now. This top from Zara gives me the best of both worlds a peek a boo shoulder and it is velvet. I styled it for Christmas Eve with faux leather shorts and tights and was excited to wear it this past weekend without a jacket since the weather was amazing it allowed me to show off a bit of skin. I was never a fan of a trench coat, I found them way too masculine for my taste. Until I found this soft trench at H&M and felt in love with it instantly. I love that I can dress it up or down depending on the occasion and it is the perfect transition piece from Winter to Spring.